On 13/11/2018 at about 1730hrs, Assistant Comptroller of Custom Justina Tanko was Kidnapped by a gang of Notorious kidnappers and taken to an unknown destination from a Restaurant she frequents. Upon receipt of the information on her kidnap, operatives of IGP-intelligence Response Team IRT deployed to Port-Harcourt by IGP Ibrahim K. Idris led by DCP. Abba Kyari immediately commence investigation into the kidnap and with the aid of technical intelligence, active members of the gangs were identified. Immediately after a negotiated ransom of five million (5,000,000) naira was paid by her family on 15/11/18 to avoid risking her life during Rescue Operation and her Subsequent released at about 2330hrs of same day. Operatives immediately commence action and within 24hrs after her release the first suspect was arrested and subsequently in an operation that lasted for about 72hrs seven (7) confirmed members of the gang were arrested. 1. Zigabari Voonu 'm' 32yrs from Ogu-Gbolo LGA Rivers State. Works as a security guard in the restaurant the Customs Officer frequent, he brought the kidnapping job to one 'Bobo" & his gang. He also alerted the gang when the officer arrived the Restaurant on the day of the kidnap. He is a member of the deadly degbam secret cult. 2. Maxwell Barindom 'm' 32yrs from Gokana LGA, Rivers. He is a member of Degbam secret cult and a close ally of the leader of the gang. He partook in planning the kidnap and his phone was use for ransom negotiation. 3. Dele Kunewo-Liaga 'm' 35yrs from Gokana LGA Rivers State. Has brought numerous kidnap jobs for "Bobo" & his gang. He is also a member of the deadly Degbam secret cult. 4. Tordi Barinaa 'm' 27yrs from Gokana LGA. An active member of the gang and has gone on numerous kidnap operations. He is also a member of the deadly Degbam secret cult. 5. Godspower Keenom alias "Immortal" m 23yrs from Gokana LGA Rivers State. 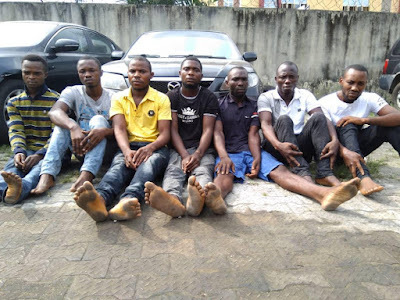 An active member of the gang Involved in numerous heinous crimes including the kidnap of one Chibuike Ezewuno, whom suspect confirmed was killed and his corpse thrown into a river after collecting a ransom of 3 million naira with his share being 300k. He is a member of Degbam secret cult. [02:20, 11/29/2018] Abba Kyari 1: 29/11/18: ARREST OF SEVEN (7) NOTORIOUS KIDNAPPERS RESPONSIBLE FOR THE KIDNAP OF WOMAN ASSISTANT COMPTROLLER OF CUSTOMS IN ONNE RIVERS STATE. 6. Justice Afangide alias Max P 'm' 33yrs from Etimekpo LGA Akwa Ibom state. An ex-convict of PH max prison, engages in a lot of heinous crimes including armed robbery & kidnapping. His share from the customs officer's kidnap was 350k which he invested in illegal oil bunkering. 7. Oludofin Yakubu 'm' 26 from Ondo state. An ex-convict of PH max prison. He is the operational driver of the gang he drove the car that was use to kidnap the officer.